“I was interested in the tension between image and abstraction, how the mind could be engaged with a picture of a recognizable image while perceiving abstract space at the same time. That was in the air at the time, this figure/ground relationship. I took the idea of figurative form and put it on top of a pattern and that’s where the mechanics of these paintings began. It kind of all began at the end of my second semester at CalArts. I was only there for one year, in 1977.” Jonathan Lasker in conversation with Phong Bui, Brooklyn Rail, July 11, 2016. “Then there’s Mr. Lasker, who refers to his art as an “image kit” and declares that his purpose is to instill “a self-awareness of how one construes a painting.” His description conveys an accurate sense of detachment: In Mr. Lasker’s hands, image and mark (less so color and composition) are means that remain means. With painstaking clunkiness, the paintings transform their components into signifiers—symbols of form, not altogether the real thing. Each canvas is a rebus of painterly affectation.” Mario Naves on Jonathan Lasker, “Clarified and Incoherent: The Art of Jonathan Lasker,” 2012. Mario Naves description of Jonathan Lasker’s is on point. And I hear similar things from you guys all the time. 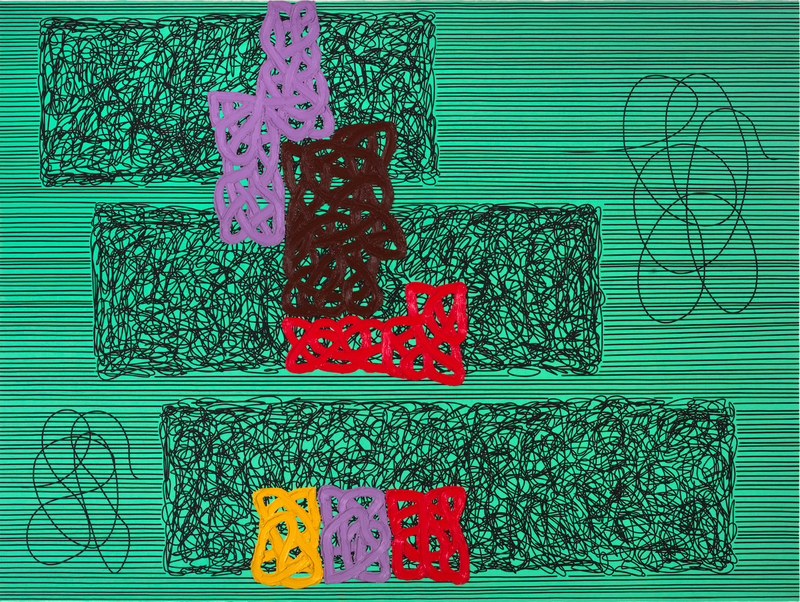 I understand Jonathan Lasker’s work is conceptual with a capital “C.” These paintings are not about lushness or beauty – though they “appropriate” and consolidate those things with his manufacturing process. His color is difficult and his composition is straight forward. The paintings are deliberately “dumb” looking – sort of cleaned-up-clumsy. But Lasker is taking on a tradition of American Painting lost in the mannered Brush Stroke and the adulation of the Kantian paint hand. His paintings are stroppy and edgy on purpose. They are complex with a critique of not only the first wave of Greenbergists, but also those later Mannerists who still revered the power of the Brush Stroke. And yeah – they are always not-so-pleasant to look at. So to my friends who take me to task when I bring up his work – I get it and I agree. But like so many of the Abstract Mannerist paintings – these works aren’t made to please. A total punk.